Wahl is a company that has earned an excellent reputation throughout the years thanks to its range of good quality clippers and razors all at affordable prices. In this post we will review and compare two of Wahl’s most popular Hair clippers, the Wahl color Pro vs Chrome Pro. The Wahl Color Pro Hair Clipper Kit is an absolutely complete kit. It even comes with a cape! The package that contains all the accessories can be used as a travel case, where all items sold together with the clipper fit very comfortably. It’s also quite a sturdy case and so the items within are well protected. Inside there are various accessories, including barber scissors and combs, a bottle of blade lubricant, a brush to clean and remove the hair from the blades, a protective cover and, the best part, several colorful, adjustable comb guards. Each guard size has a different color so that the different lengths can be easily identifiable and once you get used to your preferred length, it is easier to remember the combs that you usually use. There are also two completely black guards which are intended for cutting over the ears (the guard teeth are not of the same length and have different shapes so that you can use one for the right side of the head and one for the left). The guard combs are easy to attach and they adhere perfectly with the hair clipper blade block. This enables for a more fluid job and is ideal to avoid residual hairs being logged between the surface of the blade block and the attachable comb. In total there are 11 attachable combs of various lengths, including the two for the ear area. The 9 colored combs range in sizes from 1/16’’ (1.5mm) all the way up to 1’’ (25mm). This hair cutting machine comes with many more combs than you will probably ever use, however it’s always nice to have more cutting options available, especially since there is no added cost given the overall price of the set. For a closer cut, you can also use the clipper without attaching any comb guides. This brings us to the next best feature of the Colorpro, that is, the blades and cutting capability. Color Coded Attachable Guard Combs for easy identification. Can be used without attachable combs for close shaves. Bulky and heavier than the average clippers. The Blades and their cutting quality are certainly one of the most interesting aspects of the Wahl Color Pro. First off, the clipper will enable you to select several cutting measures even before you attach a guard comb. The minimum cutting length without a comb is about 0.8 mm and the blade can be adjusted through the side lever reach a Maximum of 2 mm hair length, without needing a guard. To select any size among those in this range, just rotate the side lever. The width of the blade is of 1.75’’ (44 mm) which is fairly normal for the standard old school hair clippers. This product is designed precisely for a quick haircut, however at this width it will not be very suitable to work on the beard, even if for a quick trim. The blade block is completely made of steel, with the two metal plates joined together with screws. This makes it very sturdy and durable, but will also involve a bit more maintenance from your part. Maintenance can be quite difficult because the blades cannot be detached with a simple click. To clean them thoroughly you must unscrew them and, once cleaned, they must be placed back in their original position. It is also worth emphasizing that it is not possible to rinse these clippers under running water (they are corded after all!). The high quality steel blades do not need to be oiled after each use. Having said this, the pack does come with a bottle of lubricating oil, and from time to time, you should squirt a few drops on the blades. This will ensure they last longer. The blades of the Wahl Color Pro are sharper than normal stainless steel blades and are also self-sharpening ... well, it doesn’t get much better than this! The Wahl Color Pro 79300 is powered by a fixed power cord and cannot therefore be used in cordless mode. This is somewhat of a limiting factor in terms of maneuverability, however, we should note that the cable is long enough to allow for the necessary freedom of movement while cutting the hair. The cord is well protected at the base and fitted with a rubber ring that allows you to hang the clippers to the bathroom wall or wherever you prefer. More recently, Wahl has come out with a cordless version of the Color Pro Hair Clipper which you can check out here . The advantage of corded clippers is that the motor will usually be more powerful, and in the case of Wahl they tend to have a monster motor in most of their hair cutting machines. This model is no exception. The engine power is impressive, as you will realize on the first cut. Wahl did a great job, creating an ergonomic design that makes it comfortable to grip, however the size and weight of these clippers are bigger than the average clipper. This is somewhat typical of many Wahl Clippers since they kept the old but reliable structure. This model, in particular, however is quite heavy. Part of the weight is definitely due to the bulky dimensions, but also to the hard casing of the product, which in fact looks very solid and resistant. The shape is elongated, with a swelling close to the blade block. When considering maneuverability and handling, something is lost with respect to the more modern designs, especially for those who work on themselves without any external assistance. In any case, the Wahl Color Pro offers suitable support points and the overall grip is to be considered comfortable. The Wahl color pro is definitely a high quality product at a very reasonable price. It is heavier than we would have expected and this can affect the hair cut especially if you are a beginner. With its wide cutting blade, it is not ideal for other tasks, such as, trimming the beard, but on the other hand this wide cutting frame does allow a quicker cut when used on the hair. The color coded combs are a definite plus and come in very hands when you’re in the middle of a haircut since they help you quickly identify the exact comb you need. 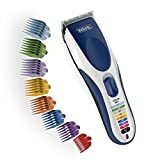 This is definitely a good hair clipper, however we recommend it for those who already have a little experience and are looking for a fast and precise cut. For beginners, maybe it’s best to start with something lighter and more manageable. The Wahl Chrome Pro Deluxe kit is a complete package, consisting of several elements that will speed up and extend the cutting quality and precision. The price range of this kit is slightly more expensive then what you pay for the Color Pro, however it is still within the average for hair clippers. This kit definitely brings more to the table tough, starting with the cordless body trimmer that comes included within the price. Kit comes with cordless body hair trimmer. All the accessories come in a large and handy case, which however is a soft case, unlike the hard, rigid cases that Wahl offers on some of its other models. This case is large enough to fit all the additional pieces that come with the kit, including the cordless trimmer, the two barber combs, scissors, two hair clips, lubricating oil, cleaning brush and small mirror. That’s not all though. The kit comes also with a variety of attachable comb guide of various sizes, not to mention a plastic cover to protect the blades from accidental bumps when the clipper is not in use. There are also some "special" combs that can be attached to the clippers. Two of them are used to adjust the area above the ears. These are marked with the letters "R" and "L" being for Right and Left sides. Then there's another type of comb, once again, that can be attached to the blades, which is used to trim the eyebrows. The Wahl Chrome Pro Hair Clipper itself is a basic corded hair cutting machine, very simple with one function and purposes, to cut your hair quickly and precisel. Possibly the really distinctive feature of this Hair cutting machine is the possibility to choose between 5 distinct cutting-length positions without even having attached the guide comb. This means that using just the blade, the chrome offers 5 different lengths by just flipping the side lever. This is an extremely convenient solution for those who cut their hair within 3 mm in length. The Wahl Chrome Pro Deluxe offers both speed and precision thanks to its wide blade frame and Self-Sharpening Precision Ground blades which are made of high carbon steel. While the blade is wide, it is not too big to be used also as a beard trimmer. The Chrome Pro Deluxe allows you to adjust the cut up to 1/8’’ (3 mm) without any guide combs attached. This allows for quick adjustments when cutting the hair and can also be used to trim beards. The maximum cutting length, with the help of the attachable regulating guide combs, reaches up to 1’’ (25 mm). The blades should be lubricated after every use to keep them in top condition. They cannot be rinsed under the tap and are not detachable with a simple click. So, while you’re not required to do this with every use, for a detailed cleaning of the blades you will have to remove the screws that secure the blades to the machine body (similar to the Color Pro). The Wahl Chrome Pro Deluxe set also comes with another hair cutting machine, a small cordless trimmer that is ideal for applying the final touches to the hair cut and also for trimming other areas of the body. Similar to the Color Pro, the Wahl Chrome Pro can only be used with the cable and therefore does not work in cordless mode. On the other hand, the additional trimmer that comes with the set is a cordless machine which is powered by the classic AA type batteries. Getting back to the main hair clippers in the set, however one must remember that this is a Wahl after all, and the American manufacturing house has always given great importance to the engine behind its products. The Chrome Pro in fact is equipped with Wahl’s ‘Ultra Power Motor’, a power system that is ideal for high performance cuts. No wonder this machine is one of the favorite ones used by professional barbers. When considering the size and design, we had to take note that the set comes with both a hair clipper and a trimmer, which means that between the two, you will be able to cater most of your head and body hair cutting need. The hair clipper is a solid piece of equipment, and even though it is much lighter than the Wahl Color Pro, it's still quite bulky. The ergonomic design has a thinner lower base which includes a non-slip lining. This allows for a firm grip and greater control. The cable is over 2 meters long and is therefore perfectly suited for maximum freedom of movement. The cable is well protected at the base by a rubber tube and there’s also a ring to hang the clipper on a wall hook. The cordless trimmer that comes with the kit is obviously smaller and lighter. With a cut width of about 1’’ it allows for precise definition when needed. It’s therefore a good solution for trimming the side-burns and under ear-parts, and can also be used by the more adventurous of you for designing buzz cut graphics in the hair, (the various designs within the hair frame like these). The trimmer’s frame and design is similar to the main hair clippers, and is also covered with non-slip material for an ergonomic grip and better maneuverability. The Wahl Chrome Pro Deluxe model strikes for its very comfortable design, solid materials and excellent grip . It is not a featherweight, but is lighter than most other Wahl clippers. The cutting is very fluid, even with the guide combs attached, thanks to a powerful engine and constant uninterrupted force, but also due to the quality of the blades. To maintain this result you will have to take care of it and we suggest you lubricate the blades before or after each use. The hair clipper has a very distinctive design that resembles professional models, but which also has features similar to the latest generation hybrids, which are models that are exclusively designed for home use. The strong points of the Wahl Chrome Pro is the side lever, which allows you to adjust for lengths of up to 3 mm in 5 distinct positions without using a comb . Another advantageous element is the cordless trimmer which is useful for shaping the beard or applying the finishing touches on your haircut. Wahl Color Pro vs Chrome Pro - Your Choice? As you can see both the Wahl Color Pro and the Chrome Pro are tremendously powerful hair clippers that can be easily used by professional barbers, but affordable for home use also. You'll have to see which features found in each one is more useful for your own personal requirements, but whichever one you choose, we're quite sure it will get the job done. So, which one will you choose?​ Wahl Color Pro or Chrome Pro. Slowly but surely we're building a list of our absolute favorite makes and models available for you to buy. Check out our Current Top 5 Hair Clippers here. Check out other makes and models of Wahl Hair Clippers on our Amazon Quick Search tool below. We review the Wahl Color Pro vs Wahl Chrome Pro. Which one should you buy. Click to find which one of these popular Wahl hair clipper models is right for you. Wahl have a very good guide on their site about fades and they also have a haircut guide which you can download for free. You can find this here. Thanks for the clear review! I would like to know what is the maximum length in mm when cutting without a guard and with the lever open. In the article you say 2mm and then 3mm ? Is it because they both cut different maximum size without a comb ?